At my home, I think I am the only one who loves rajma. I had this for the first time in Belgaum and ever since then, I have been a big fan. I saw two of my friends, who were from Delhi, make a very creamy and tasty rajma. I tried exact same recipe, I was never able to get the same consistency. I think it is because I never have patience to fry the onions and tomato paste well and I don’t use ready made puree. Then my dear friends Anita and Bee posted their versions of rajma which made me drool. Then one day, in a Kannada book, I saw rajma with yogurt and I wanted to give it a try. I didn’t follow the recipe, but I just followed what I remembered from college days and also Anita and Bee’s versions to make this. So the best thing about this recipe is, no tomato – that helps me becauseÂ these days my fridge is almost always empty.Â I was bowled over by the taste of it, exactly like I love. The best part is V loves this (who by the way never liked to eat rajma before this). As I mentioned, this is not the authentic recipe, check the links for authentic ones, this is just something I love. Give this a try. Soak beans in water overnight and cook in pressure cooker till they are soft, but still retain their shape. Heat a little oil and add cloves, cinnamon, cardamom, onion and fry till onion turns brownish. Then add chilli powder, turmeric powder, salt and fry for few minutes. Add yogurt, besan and cook on a medium low flame for 2-3mins. Add cooked beans, garam masala and let it cook for about 10-15 mins till it thickens. Preparation time : 30mins (these beans take a long time to cook). PS: Besan is optional. When yogurt it heated, the water seperates and it breaks. Besan avoids this, so I usually add it when I need to heat yogurt or buttermilk. I should try adding besan..Otherwise I make it almost in a similar way..Looks great..
i’m crazy about rajma. i’m gonna try this very very soon. to avoid yogurt breaking, hang it in cheesecloth for an hour, and use the thick stuff. even works for lowfat yogurt. or use sour cream. it doesn’t split, but i prefer to hang homemade yogurt. i love rajhma, specially rajhma chawal. this rajhma looks sooo tempeting. Like Bee says, home made hung yogurt is an excellent option. There’s a masoor dal I made this way on my blog. [WORDPRESS HASHCASH] The comment’s server IP (66.79.167.213) doesn’t match the comment’s URL host IP () and so is spam. Whenever you mention about Belgaum I start missing my days there..Nostalgia!! My mum rajma very similar to this. Shilpa, you brought back some lovely memories! Another trick to keep the yoghurt from separating is to add it to the rajma at the very end: first take a spoon of the gravy and mix it well with the yoghurt in a cup and then add. Rajma is yet another dish I hadn’t come across before… but I have all the ingredients at home, so could be making an appearance soon! 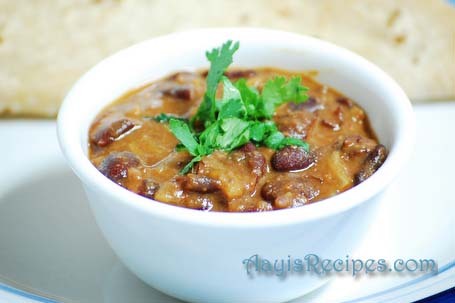 Lovely rajma recipe. I used to make rajma once in a week. Love the recipe. Rajma looks superb,a very simple variation for the otherwise lengthy onion tomato gravy procedure! HiShilpa!! how are u dear? I don’t get time to post comments, but I do read ur recipes! loved the different rajma…..Am trying this over the weekend!!! Something new and yum to me. Never tried out this combi. Looks gr8. Thats nice. I love your recipe ideas and try them often. I usually cook Rajma with a couple of tea bags or one tea spoon of tea powder wrapped in a thin cloth. It gives unique taste to Rajma. Regarding Yoghart, I simply put it while griding the paste. I never had the problem of splitting. Without tomato..will try this. This is my first time here.Lovely blog.Your recipes are very interesting and the pictures are mouthwatering.Im gonna try ur “rajma with yogurt”..thnks for the recipe. We make Rajma every 10 days or so at home and I look forward to trying your version the next time around. Thanks Shilpa! Nothing to beat yogurt in sheer versatility – I’m adding this recipe to the 1001 raitas One page cookbook. Thanks ! tried rajma today.. it was real tasty! but the color dint come as good as yours! :(.. mine had the yellowis white color similar to Khadhi..how do i get the brownish color ? Shilpa: Maithri, the “Byadagi” chilli powder that I have gives a very bright color. Also, I cook the dish for longer time, by this, the rajma also gives out its bright color. I have always made Rajmah with tomaotoes, all other ingredients same as yours, except for the besan. I also add lots of finely julliened ginger and low-fat sour cream 9add the cream at the very end) and have never had problems of curdling….comes out very tangy and yummy..
Will definitley try with Besan, hubby loves anything with besan !! Shilpa: Chetna, It does not have any taste of besan to it. This version was mainly ivolved because I wanted to avoid tomatoes and also wanted to keep it simple by adding whatever available in refrigerator. [WORDPRESS HASHCASH] The comment’s server IP (72.232.131.30) doesn’t match the comment’s URL host IP () and so is spam. I tried it today along with your masala pulav recipe. Thanks for such simple and nice recipes. Rajma with yogurt and no tomatoes looks really interesting. But i had a quick question, while adding the cooked beans do i have to also add the water used for cooking the beans? Thanks for sharing the recipe. You have nice blog here. Shilpa: You can use the water. Can this recipe done with canned kidney beans? I tried this a few days ago. It was the first time I ever used Raajma. While the dish tasted really yumm, the beans were pretty hard. I hadn’t boiled them enough. 15 mins of pressure cooking was probably less. Next time I’m planning to pressure cook them on low flame for at least 20 mins. Wow! it just tastes excellent. it is so simple and easy to cook. this is the first time i have made one without tomato and it is really good. I follow ur blog regularly and u make it look very simple and easy. keep up ur good work. can u post a recipe of Sarkarai pongal. My husband suddenly got all crazy about having rajma. i have never cooked one. I searched all sites through, but everybody gave the same recipe. But the best of all was yours because it was different and I love adding yogurt to my recipes. I am boiling my beans now. I hope It turns out perfect just like yours! hi shilpa, thanks for this wonderful recipe. Iam going to try it now. It was not good. I like the traditional punjabi style. hi shilpa, thanks a lot for the wonderful recipe. I tried it today, we all loved it yummy………. Tried this curd version rajma and it came out very well. Infact the gravy is much creamier than the tomato version 🙂 thanks for the idea!